Hi friends! I’m beyond moved and excited to share the first in my new series, Works in Progress. While this blog is about my journey with anxiety, I wanted to share other stories. The stories of everyday people who are bright, shining stars constantly battling their own versions of mental health. Today, I bring you Grace. She is not only a friend, but a raw, radiant soul who has been through quite the journey of severe anxiety and depression which ended in a realization that through therapy and nature, self-love can be achieved. I’ve had the privilege of working with her and becoming a close friend when she lived in San Diego and fun fact, she is a huge reason why I am currently in therapy. This bomb lady climber and world traveler has a passion and eloquence that cannot be denied. Meet Grace. Although I think I always had some form of it, which I think is partially hereditary, I began fully experiencing anxiety in 2013. Looking back at the spring and summer of that year, it’s obvious that my anxiety was triggered by a set of significant events that happened within a three-month period (being present for the Boston Marathon bombings, my first heartbreak, and whisking off to New Zealand to study abroad). My first panic attack happened out of the blue in New Zealand. While a very unhelpful counselor there explained that I was merely homesick, the panic attacks, depression, and debilitating fear over things I loved (i.e., camping, rock climbing, going on impulsive adventures with no plan, meeting new people) travelled back to Boston with me. My life was drowning in loneliness, I was cutting myself off from friends, feeling unwanted, having regular panic attacks in the dark, and was suffocating from a sense of hopelessness. I sported the daily fake smile, even in front of my closest friends, so I wouldn’t draw attention to my suffering. I was having stomach problems too which, at the time I didn’t connect to my mental health. I had constipation (TMI!) and there were times where I could barely eat more than five bites of a meal and would go for days on that alone. I saw a string of gastrointestinal doctors who could never diagnose what I had but still prescribed me plenty of medicines. I didn’t get help by choice. I was finally climbing again my senior year of college when a climbing partner had a gnarly climbing accident. I now know that my anxiety is linked to feeling safe, so when this happened I spiraled out of control. Thank God/the Universe/the Great Spirit in the Sky/whatever you subscribe to, I broke down in front of my old boss. He took me for a walk and by the end, he had the school’s counseling service on the phone and was holding it up to my ear. While I went to counseling at school, which involved switching counselors, never feeling comfortable enough to be honest with them, and a psychiatrist who was thinking about putting me on medication, I never felt better. Eventually I stopped going. Soon after, I once again went through a string of sudden changes (graduating college, divorce, and moving to San Diego) and everything got worse. I don’t remember what led me to therapy in California, but I found a therapist in San Diego who I was finally comfortable with. Although I only saw her for a short amount of time, she kick-started my real process of dealing with my anxiety. The biggest thing that helped, however, was traveling for four months with my boyfriend. At the beginning of the trip abroad, I was having daily panic attacks. But by slowly putting myself into sometimes extreme situations that took me far outside of my comfort zone, I learned how to manage my anxiety. My anxiety is still an obstacle in many facets of life. It pops up when I am in new situations, when I start to get overwhelmed with little tasks, in doing things I’m used to, and in the random, unprovoked moments that it decides to be present. The biggest challenge is remembering that facing anxiety isn’t about “getting better” or making it disappear, but is about learning how to healthily handle it. The biggest skill I’ve learned is talk to people. Isolating myself only makes things worse and isn’t being strong, it’s a fear-based action. Talking to others is not some big admission or outpouring of feelings. 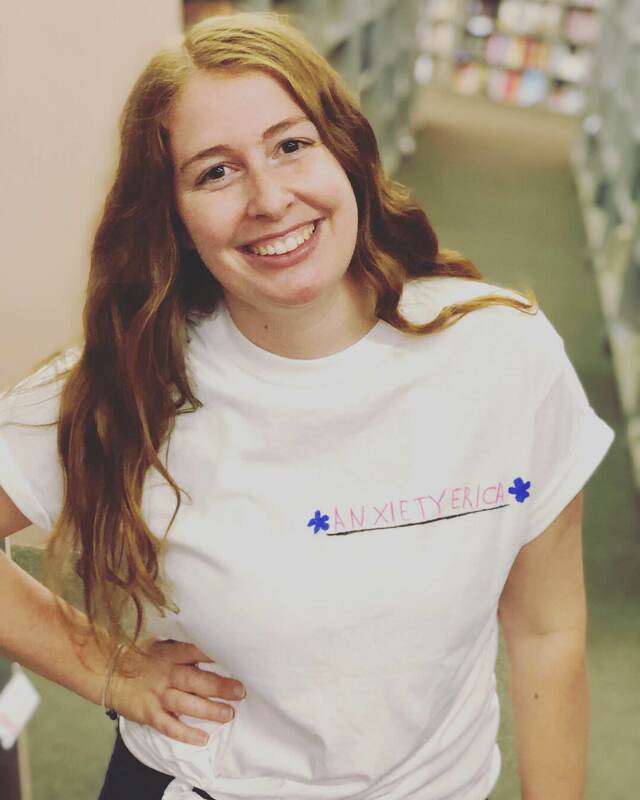 It’s simple statements like “I feel anxious,” “I am overwhelmed,” “I feel sad,” “I am uncomfortable,” or (mainly when I am overwhelmed by others) “I need alone time.” Saying it out loud sets me free because I am not trying to deny my anxiety nor am I trying to proudly suffer alone. Talking to others also reminds me that my feelings are valid. Having a few basic mantras that I can fall back on has also served me well. Whether I repeat them to myself or someone says them to me, they ground me in moments of high anxiety. Other little things help me like writing, going for a walk, yoga, reading, art, music, being outside, meditation. Anything that can help me step back from a situation and breathe. I am constantly working on coping with anxiety. It’s a never-ending process that changes each time I feel anxious. And that’s okay! Without anxiety, I wouldn’t know myself. If I didn’t have anxiety, and more importantly if I didn’t seek help it, I might have been a stagnant human. Learning about my anxiety has forced me to grow, to learn about my past and present, and to question my thoughts, feelings, ideals, spirit, and the world around me. Meeting my anxiety has made me meet myself. My anxiety can manifest itself in my intestines, stomach, back, and in general injuries. When I am getting anxious and don’t realize it, I get injured much easier (which is why in college I was constantly on crutches, in a brace, or otherwise hurt but now I rarely tweak things) and recurring problems will flare up. Learning about my anxiety has made me listen to my body and be mindful of its needs as well, ranging from eating better and being more active to eating more ice cream and being a bum, letting myself cry out anxiety and stress, or just having days where it does nothing but rest and decompress. To the chagrin of a few, the exploration of myself has made me meticulously examine others close to me. I question other’s past and beliefs so that they too can start their own exploration of themselves (if they are willing). TALK TO PEOPLE. Stop cutting yourself off because people love you and want to help you. You are not a burden. Friends want you to be there and family always love you no matter what. Suffering alone is never beautiful or noble. Every tear you have is valid and important. You are a strong magnificent goddess who can do anything. Want to learn more about Grace and her adventures? Go check out her personal instagram, @gracexplorations, and her travels with her boyfriend at @wandering_wonderers.